Sports car enthusiasts will be able to purchase the 2020 Toyota GR Supra for a Manufacturer’s Suggested Retail Price of $49,990. The 2020 Supra goes on sale in summer and will be available in two grades — 3.0 and 3.0 Premium, as well as a Launch Edition which will be based on the 3.0 Premium grade. Driving enthusiasts can look forward to an exhilarating blend of power, precision and agility thanks to a rear-wheel drive design that honors Toyota sports car heritage with its low center of gravity and optimal weight balance. There is a strong connection to Toyota’s 1967 2000 GT and 1993-2002 Supra in both design and mechanical configuration. Yet, the 2020 Supra is a fully forward-looking sports car, brimming with a cutting-edge powertrain, chassis and multimedia technology. 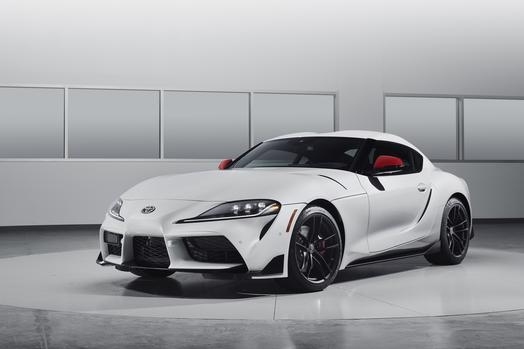 Like the pinnacle of the previous Supra series, the 2020 model will be powered by a turbocharged inline six-cylinder engine. The new Supra’s 3.0-liter twin-scroll turbo six will produce 335 horsepower and 365 lb.-ft. of torque and will be teamed with a quick-shifting 8-speed automatic transmission with paddle shifters. Toyota projects 0-60 mph acceleration in 4.1 seconds, which makes this the quickest Toyota-branded production vehicle to date.